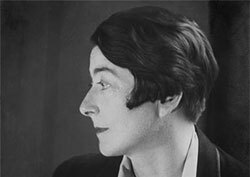 In an industry and time dominated by men, Eileen Gray was an Irish Mid-Century modern furniture designer and a trailblazer in both the art deco movement. She epitomized the independent woman when such a lifestyle was as brazen as can be. Whether you are an avid fan of her work or have never heard about her, you’ll want to read on about this truly one of a kind Mid-Century modern furniture and architectural visionary who was way ahead of her time. In this blog post, we’ll discuss Eileen Gray’s early life, her most famous works, and how she still influences Mid-Century modern furniture design even today. Gray was born to an aristocratic family in Southeastern Ireland in 1878. During her childhood, she greatly benefited from a father who was a painter and encouraged passing on artistic abilities to his daughter. Eager to expand on her abilities, she enrolled at the Slade School of Art in London at the age of 20. She migrated to Paris in 1902, living most of her life there. While in Paris she tediously studied to earn the title of the first western practitioner of Japanese lacquer. Lacquer is a clear or colored wood finish that dries usually using solvent evaporation. This produces a hard, durable finish for the wood. While in Paris, Eileen Gray met Japanese lacquer designer and craftsman Seizo Sugawara. Sugawara came to Paris because he was hired to update the lacquer work exhibited in the Exposition Universelle. Gray immersed herself in the craft of lacquer for 4 straight years. Arduous and labor intensive, lacquer woodworking also uses toxic and hazardous materials. Gray then discovered that she developed lacquer disease on her hands, which is a form of dermatitis that comes from prolonged exposure to lacquers. Determined to master her craft though, she trucked on despite her troubled hands. Finally confident in her lacquer work in 1913, she exhibited her lacquer work which was a huge success. Her styling broke away from the Japanese norm, often utilizing glossy surfaces in her designs. One of the things that made Eileen Gray’s designs and studio so uniquely impressive was that human needs should guide the designer. The art of the engineer was not enough; she wanted her works to have equal parts style and functionality. Because of this, she served a wide vary of high end, chic clients in the 1920′s. Perhaps the most successful of her endeavors at the time was the weaving of carpets. As she aged and adapted to the markets of the time, many of her decorative materials were swapped out for more conservative and sensible designs. Gray’s work fell out of style and was nearly forgotten about after World War II, until art deco lovers in the 60′s and 70′s began to praise her work once more. The piece that Gray was probably most famous for was her adjustable end table. 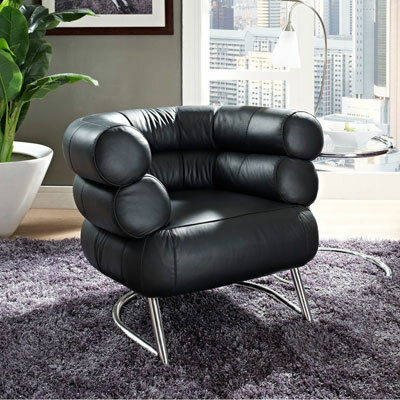 It is widely regarded as a classic staple in Mid-Century modern furniture design. Its popularity was due to her sticking fast to her belief that furniture should be as functional and accommodating to its user as it is sleek and futuristic. In its initial production heyday from 1927-30, the adjustable end table was meant to be used as a night table for the bedridden or for those who desired breakfast in bed. 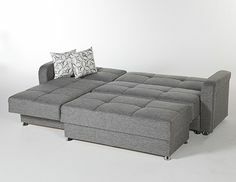 Its base fit easily under any bed and the convenient adjusting feature was perfect for any size person. Later this masterful work was also used in terraces and in living rooms. This unique chair design embodied the spirit of hard working female energy. 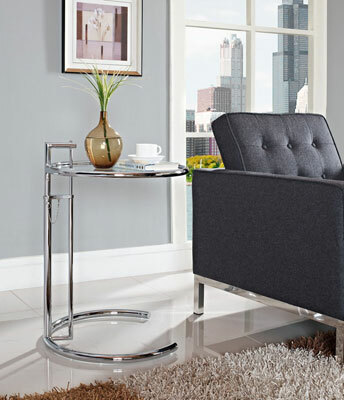 It elegantly balances comfort, support, and Mid-Century modern sleekness. Gray ironically nicknamed the chair the “Michelin Man” after his comfortable, puffy shape that resembled the chair. The Bibendum Chair’s upholstered white-leather seat and chrome-finish steel back was an eyebrow-raising, feminine take on the male-dominated proportional designs at the time. Eileen Gray’s influence on Mid-Century modern furniture design and architecture lasted long after its onset in the 20′s and 30′s. Her contemporaries like Le Corbusier and Marcel Breuer are more widely researched and studied, yet Gray might have had a bigger impact on her industry than the both of them. Gray’s work was largely forgotten up until the late 1960′s. Today, her designs are some of the most highly desired and sought after in the entire world. Her work has been exhibited in various big name institutions such as the Centre Pompidou, The Metropolitan Museum of Art, and The National Museum of Ireland. Eileen Gray’s Dragon’s Armchair is an auction record holder for furniture, selling at a whooping US $23.7 million in 2009. Gray’s work is so posthumously celebrated that the Architecture & Design Film Festival held a world premiere of the film Gray Matters in October of 2014. Gray Matters was billed as an “engaging documentary about the story of a woman, an oft disregarded design heroine and one of the 20th century’s most prominent and pivotal modernist designers.” The film follows her “early triumphs”, chronicling her life through to “middle-aged obscurity” and then ends with her “re-discovery and acclaim”. The film brilliantly showcases Gray’s approach to design, as a visionary into the everyday lives of real people not only at the time of the designs but in the future. Her ability to embody this sentiment and that of futuristic functionality simultaneously is mind-blowing. Eileen Gray was not just modern and amazing in her day, but she is still modern and amazing today. Eileen Gray was a trendsetting and amazing woman. She was a female business owner who became the first westerner ever to master a particular Japanese furniture style, all of which being extremely unheard of at her time. If that doesn’t amaze you, nothing will. She was a mold-breaker who preferred to run her business her way and is an amazing inspiration to both women and men who desire to become entrepreneurs themselves. This entry was posted on Thursday, April 2nd, 2015 at 3:30 pm	and is filed under Mid-Century Designers. You can follow any responses to this entry through the RSS 2.0 feed. Both comments and pings are currently closed.